Tiger Stripes Ministry Program is a servant leadership development program that calls us to look inward so that we can go outward to serve and love those who live on the margins of society. Designed for young people eager to create a better world, Tiger Stripes teaches and models leadership within the context of community service and outreach. Just like the stripes on RIT’s mascot, the tiger, each human is a unique and wonderful creation of God. We begin to appreciate this, and know ourselves most wholly in the context of community. Focusing on the dignity of each person, making no distinctions, we begin to walk with others and explore our faith, deepening our relationship with God, together. Ministering at Bethany House, Nativity Prep and Hope Hall, students are able to become servants, and in a sustainable model of development, servants are empowered to become servant leaders. CLICK HERE for more info and for the link to join our team! Two times a year we gather at the Mercy Spirituality Center in Highland Park to do yard clean-up, seasonal yard setup, and enjoy a home cooked meal cooked by the Sisters of Mercy! Click here to sign up! Join us in serving a meal at St. Joe’s House of Hospitality. This house/ministry does amazing things for the Rochester community, and we are so blessed to be able to join them in their mission! We will be serving a meal with Kathy, one of RIT’s wonderful interpreters who is a long-time volunteer at St. Joe’s and through other ministries as well! 🙂 Click here to sign up! CLICK HERE to sign up as a Tiger Stripes Volunteer! 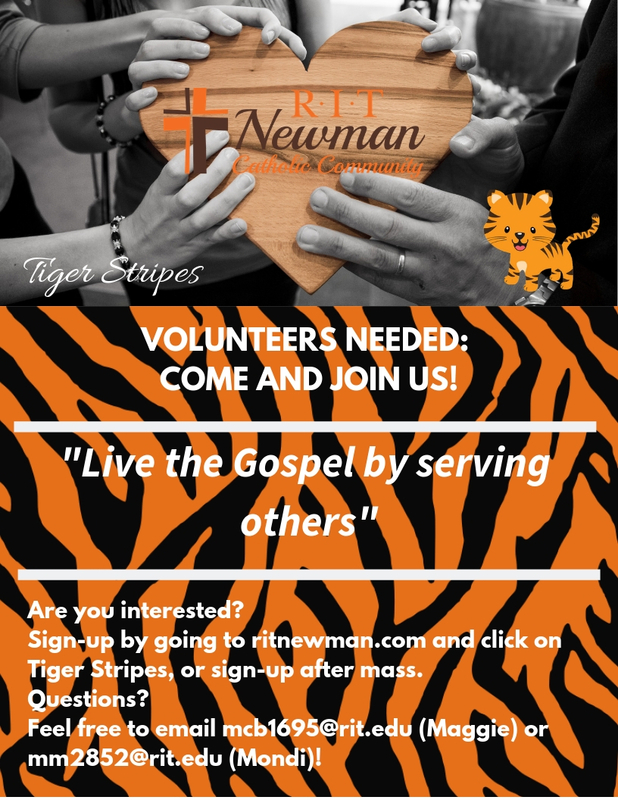 Signing up as a Tiger Stripes Volunteer with this link will assure that you get emails about upcoming volunteer opportunities!